One of the biggest perks of being on social media is that it makes communicating with your customers easier than ever. Your social media profiles are places where you can talk to fans of your brand and get to know what they’re all about. And when it comes to picking your followers’ brains, their feedback about how you’re doing is some of the most valuable info you can get. Here are a few ways to get the most feedback from the people who matter — your loyal customers. 1. Create a community that encourages feedback. The first step for getting the best feedback on social media: create a space that encourages followers to speak their minds. The best way to do this is to make sure they know you’re listening. Make responding to people a priority and don’t miss opportunities to engage. Followers won’t waste their time giving feedback that will likely be ignored. 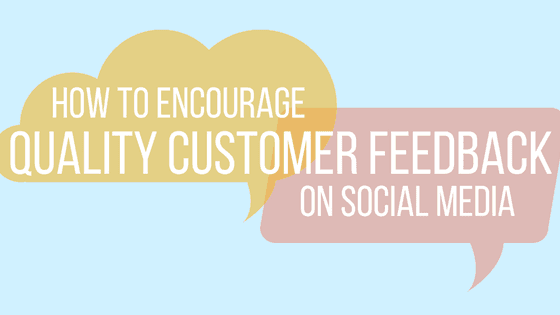 But when your customers see you truly value their thoughts, they’ll be encouraged to speak up. 2. Throw out questions to your followers. If you want feedback about something, the best thing to do is ask. Update your Facebook status with a question asking what people think about your newest product or service. If you’re designing new packaging or a new logo, post some photos and ask what design your followers like best. Asking specific questions makes it easy for people to quickly share their opinions and impressions. 3. Ask for feedback from individuals. Getting feedback from a variety of people is beneficial, but so is getting more detailed feedback from individuals. Try reaching out via direct message to a few of your most devoted customers who might have some valuable insight to share. Talking to these people one-on-one about their experience with your brand gives you details that are difficult to get on a public post. A great way to get straightforward feedback from followers is with a poll. They’re effective because they couldn’t make engaging any easier — people are able to share their opinion with a single click. Twitter has a built-in feature that allows you to develop a poll and share it with followers. And poll apps like Poll and TwtPoll allow you to create polls on Facebook and give you customization and paid promotion options. People are talking about your business everywhere, and that’s why it’s important to keep an eye out for all mentions of your business. So if your business gets mentioned on one of your competitor’s platforms, you should know about it. Regularly check up on your competitor’s social profiles and keep tabs on mentions of your business other places too — sometimes this kind of unsolicited, candid feedback proves to be the most valuable. We get it — managing your social media is a lot of work. That’s why we’ve developed social media management tools that do some of it for you. Call 844-207-9038 or email hello@mopro.com to learn more about how we can help.